Update: Tables are SOLD OUT at 105 Tables. 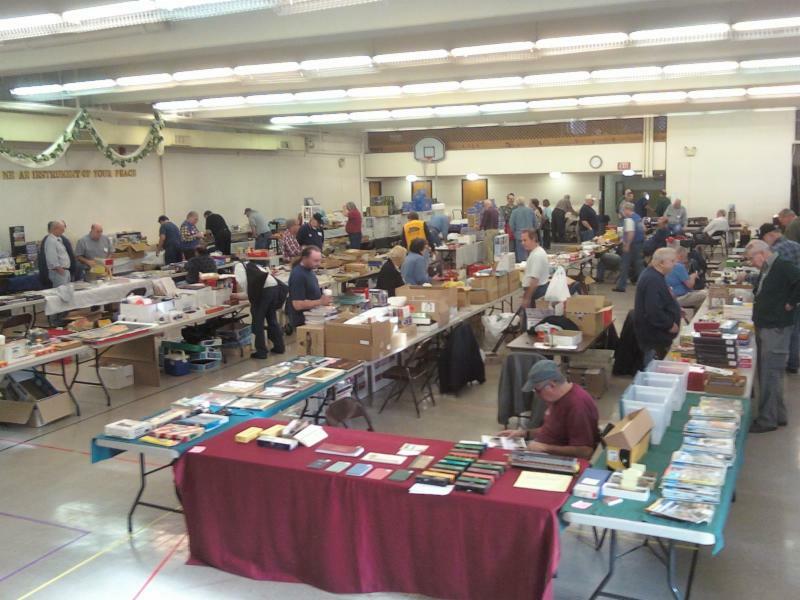 In a joint effort, the New York Society of Model Engineers, METCA (Metropolitan Division, Train Collectors Association) will be co-sponsoring a swap meet in New Jersey. The New York Society of Model Engineers, incorporated in 1926 and the Oldest Model Railroad Club in the Nation is well known for it's Annual Scale Meet which they have run for almost 20 years. This year, in a joint effort between METCA and NYSME, the meet will cover everything TRAINS. All types of trains. From the finest in scale to finest in historic tin plate, pre-war Lionel, post-war Lionel, American-Flyer, all will be represented. This new meet will offer everything: G, High Rail, O, HO, and N scales, both new and used. There will also be scenery materials and buildings for your layout. And, there will be tools, books, building materials, paints, detail parts, repair parts, first time offering of a private collection, White Elephant Table, and food. Yes, there will be a Snack Bar. You name it, we will do our best to have it for you. Less than a block away, The NYSME Headquarters with its two large layouts will open at 11:00am for enjoyment of Meet attendees. If you know where MetLife Statium is the Meet is less than a mile away. NOTE: You do not have to be a dealer. Hobbyist, take a table and thin your collection. 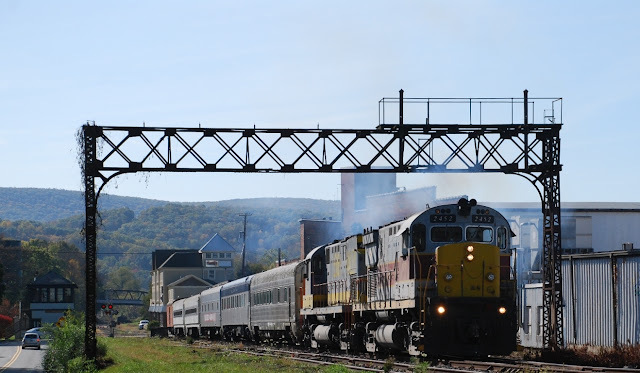 On Saturday the Erie Lackawanna Dining Car Society (ELDCS) ran a six-car excursion train from East Stroudsburg to Scranton. Passengers boarded the train for the 11 AM departure to Scranton where there would be a ninety minute layover before heading back to East Stroudsburg. The motive power consist was DL 2452 and LV 414. Behind them was Lackawanna Dining Car 469 (ex-EL 769, DL&W 469), NKP's "City of Lima" (RPCX 211) , RBBX 42010, ELDCS 1700 (ex-NJT 5718), ELDCS 1802 (ex-NJT-????) and ELDCS Power Car RPCX 1785 (ex-Army Medical Services USAX 89608, ex-Amtrak 'shorty' baggage car 1352 & Heber Valley RR 3684). Image 1-A roster shot of RBBX 42010 coupled to NKP's "City of Lima". I don't know if RBBX 42010 was used for passenger accommodations for this excursion. 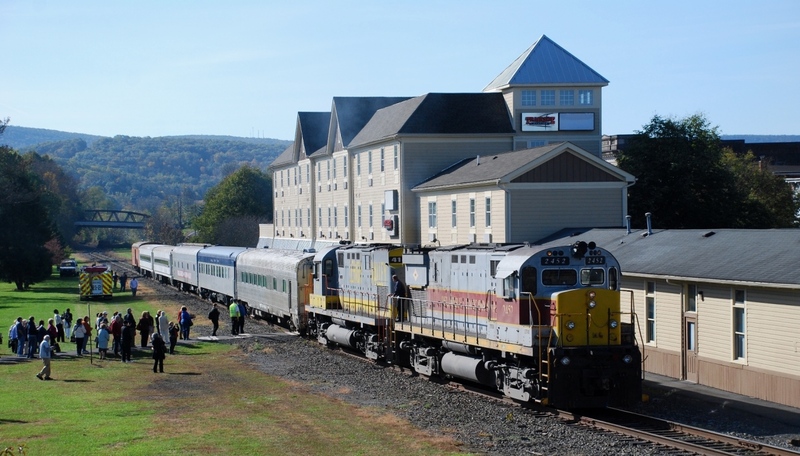 Image 2-Seen from the East Stroudsburg Tower, the passengers are getting ready for boarding the train. Image 3-The excursion departs with the next stop being Scranton. Off to the left of the signal bridge can be seen the East Stroudsburg Tower. 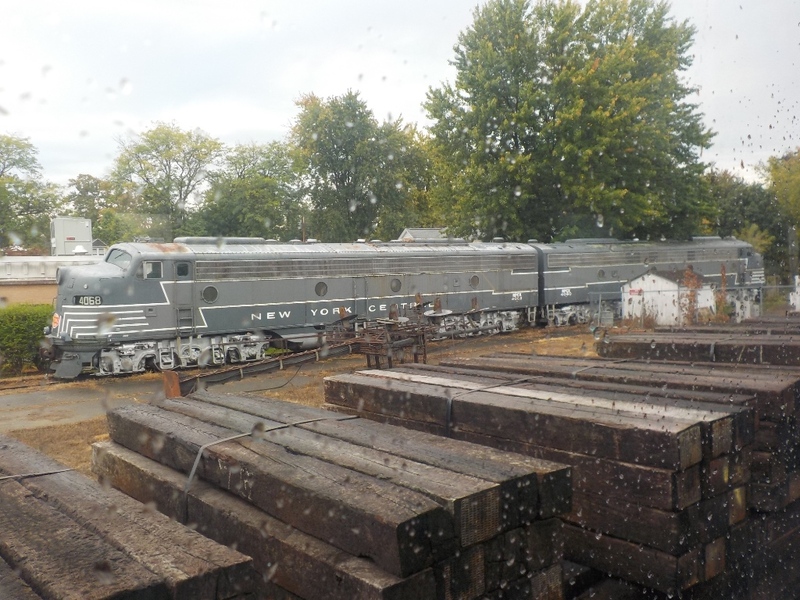 Medina (NY) Railroad Museum Fall Foliage Excursion - An Addendum! Before leaving the Medina depot I was able to get a photo of museum's NYC E8s. The story behind them is that in 2007 the museum acquired NYC 4080 and NYC 4068 still in their original paint scheme. 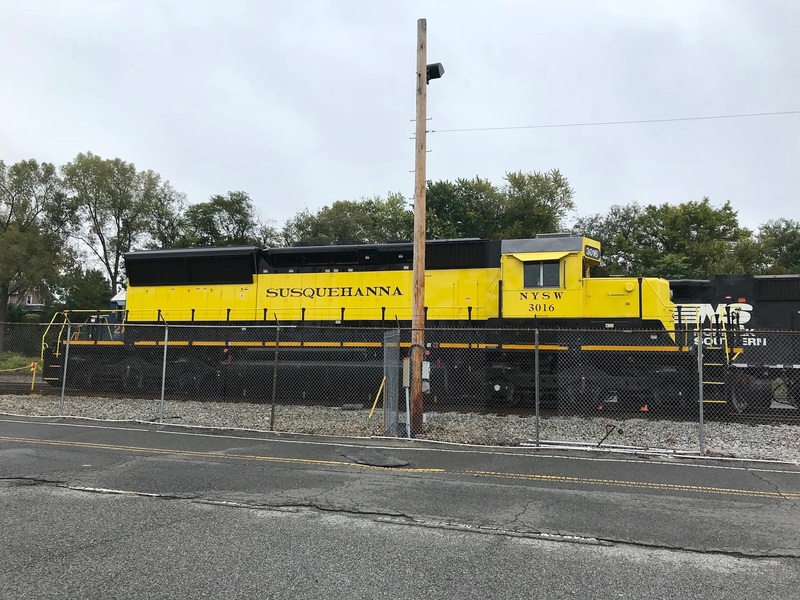 Both units were built in 1953 and are currently being restored as funding becomes available for future excursions between Medina and Lockport. 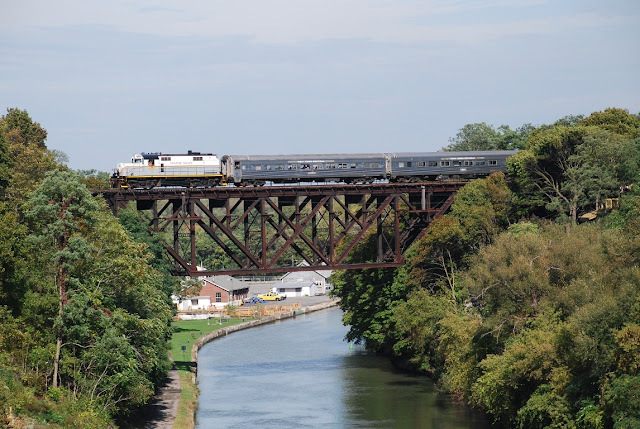 Heading back across Lockport's upside down bridge, GVT 2035 has in tow a NYC baggage car (RPCX 9640) followed by the two Pullman cars "Raymond C. Roe" (RPCX 1919) dining car and "Thomas M. Reynolds" (RPCX 1950) in an NYC paint scheme. RPCX 9640 received in 2016 a fresh coat of paint to match the newly restored Roe car and "United States Mail" was printed on the side to mimic the ubiquitous mail cars of the early to mid 20th century.The Roe car was dedicated in October of 2016 to honor Air Force veteran and longtime friend of the museum Raymond Roe for years of service in the military and his many generous contributions to the museum. 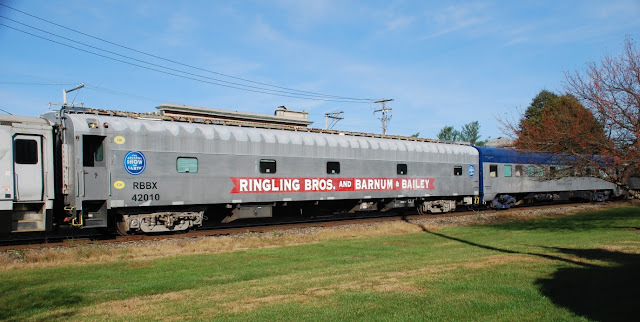 The Thomas M. Reynolds Dining Car (RPCX 1919) was named for Congressman Reynolds' contributions in obtaining and restoring the E8 locomotives and the 20th Century Limited passenger cars. Lockport's Union Station - In the late 1880s Lockport was still a busy stop on the Erie Canal and a hub for train traffic. The New York Central Railroad, owned by the Vanderbilts, decided that Lockport’s train station should reflect its importance as a major city. Construction began in 1888 and the station was opened to the public in late 1889. The 1950s and 1960s saw the station abandoned and vandalized. 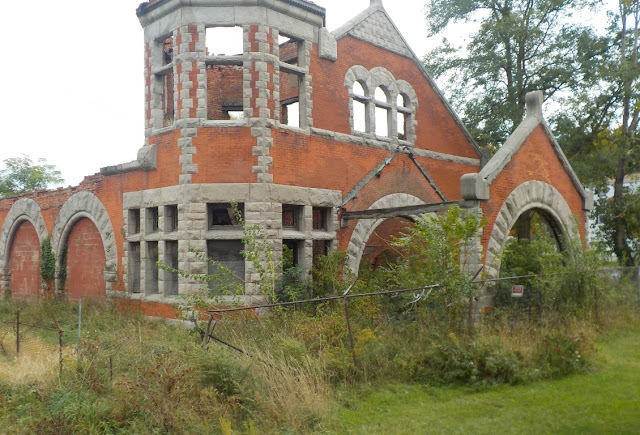 Broken windows and falling brick and stone caused a hazard to those who ventured near the derelict building. Finally, in 1967, Union Station was purchased by John Saraf Jr. for $13,000. Saraf saw potential in the structure and decided to turn it into a restaurant. Despite his efforts at restoration, he could not get the project off the ground. This is when David H. Goldstein entered the picture. Goldstein, who had restaurant experience, bought the property from Saraf in 1971. He completely remodeled the interior and decorated it with train memorabilia and antiques from the 1890s era. Union Station restaurant was a huge hit with the public. A menu from the restaurant features most dinners for under $5 with desserts for under $1. For over two years, Goldstein was able to keep the restaurant going. However, tragedy struck in 1974, when a fire of unknown origin destroyed the restaurant and heavily damaged the building. All that remains of this station is what you see! 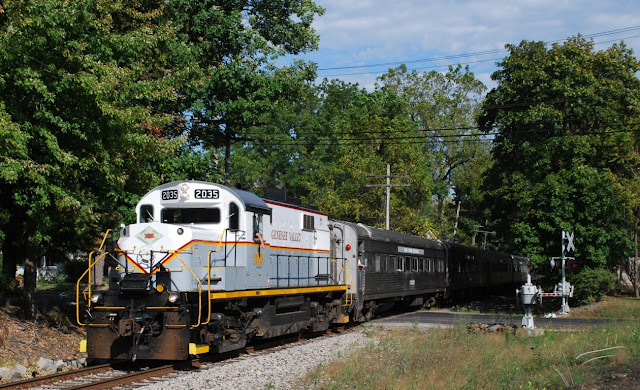 Medina (NY) Railroad Museum's Fall Foliage Excursion! On October 7, 2017 the Medina Railroad Museum sponsored two fall foliage round trip excursions from Medina to Lockport, New York. One of the trip’s highlights was crossing over Lockport’s 395 foot long “upside down bridge”. It gets that name since the deck truss looks as though it is positioned upside-down. Built in 1902, legend has it this bridge was built as an attempt to limit the size of boats that would be able to use the Erie Canal in order to put the canal out of business. 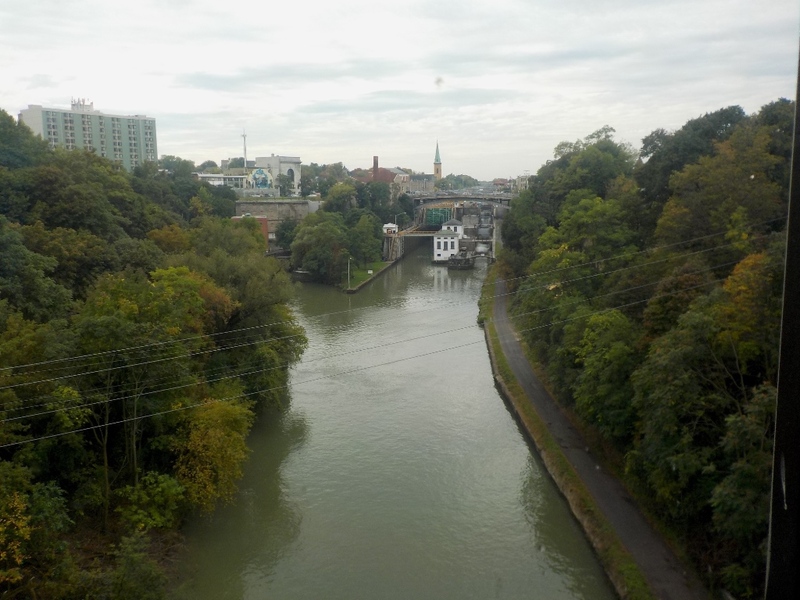 Also included is a view from my coach seat while crossing over the bridge. In the background can be seen Canal Locks 34 and 35. Those wires adjacent to the bridge are not power lines. For twenty-five dollars a person can zip line across the Erie Canal not once but twice! No boats are passing under it on this Saturday as GVT 2035 (ex-NYC 8035; ALCO RS32) leads a consist of five ex-NYC coaches (2915, 2918, 2941, 2906 and 2932), two Pullman cars (RPCX 1950 and 1919) and baggage car RPCX 9640 across the bridge. The train is also seen passing through the Prospect Street grade crossing in Lockport. Unfortunately no hint of fall colors on the trees on an unseasonably warm autumn day. 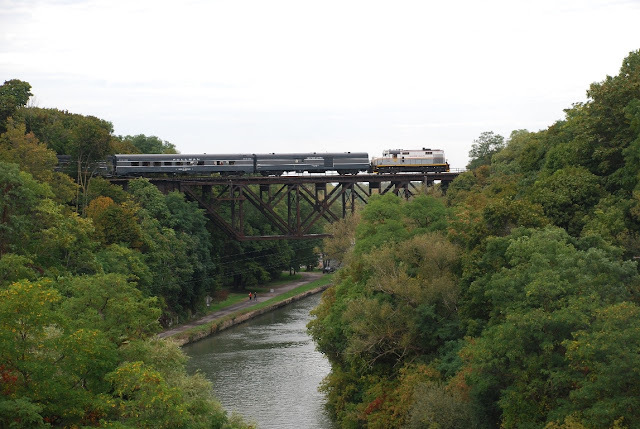 As the train pulled into the Lockport Yard GVT 2035 would uncouple, run around the train and then lead the train back to Medina. Recovery efforts are underway to restore service to areas impacted by Tropical Storm Nate. Operations to and in New Orleans, LA have been restored to service and Norfolk Southern will begin to meter traffic back into the location. NS is actively assessing overall track conditions to and in Mobile, AL. Regional flooding and power outages continue to affect this area impacted by the storm. Embargoes to New Orleans, LA and Mobile, AL will remain in place as Norfolk Southern works through the traffic currently being held across the network to these locations. Norfolk Southern will be working with customers in the impacted regions to identify switching needs and service plans as recovery progresses. Customers should continue to expect delays for traffic moving through and to all areas that have been impacted by the storm. Customers with questions regarding local service should contact their Operations and Service Support, Unit Train, Automotive, or Intermodal representative. Ongoing updates will be provided as storm recovery efforts continue. 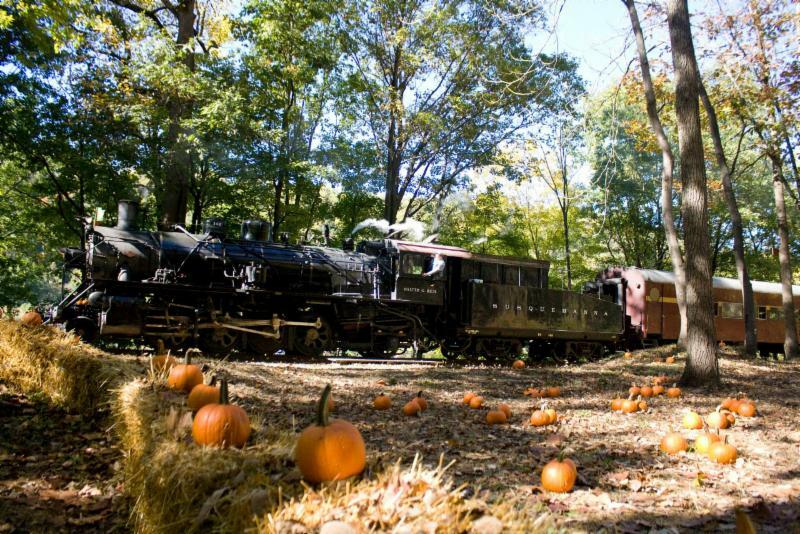 The Great Pumpkin Train Rides Again! Ride the train this weekend. In the month of October, every train is The Great Pumpkin Train. When riding the Great Pumpkin Train, every child will be able to pick their own pumpkin from the pumpkin patch. The pumpkin patch sits in a beautiful glade in front of the century old Carpentersville Lime Kilns. The lime kilns are not only the oldest but also the largest left in existence in New Jersey, dating to before the Revolutionary War! Either take a beautiful ride along the river, or take in one of our amazing attractions. Enjoy the Corn Maze, and or the Ol' Susquehanna Mine. Each are just a $5.00 add on to your Great Pumpkin Train ticket. Tickets are available on site if you should decide at the last minute! Every train stops at the Pumpkin Patch on the way home, so, don't worry, no matter what attraction you enjoy, you wont miss out on a pumpkin! Every child can pick a free pumpkin! Tropical Storm Nate continues to develop and is forecasted to make landfall on the Gulf Coast early Sunday morning with hurricane strength. Based on the storm’s current projected path, Norfolk Southern is currently preparing by repositioning rail equipment away from the low lying areas in and around New Orleans, LA and Mobile, AL. Traffic en route to these areas is being held at various yards throughout the Norfolk Southern system in an effort to alleviate congestion. Additionally, NS has issued embargoes for traffic destined to New Orleans and Mobile locations. 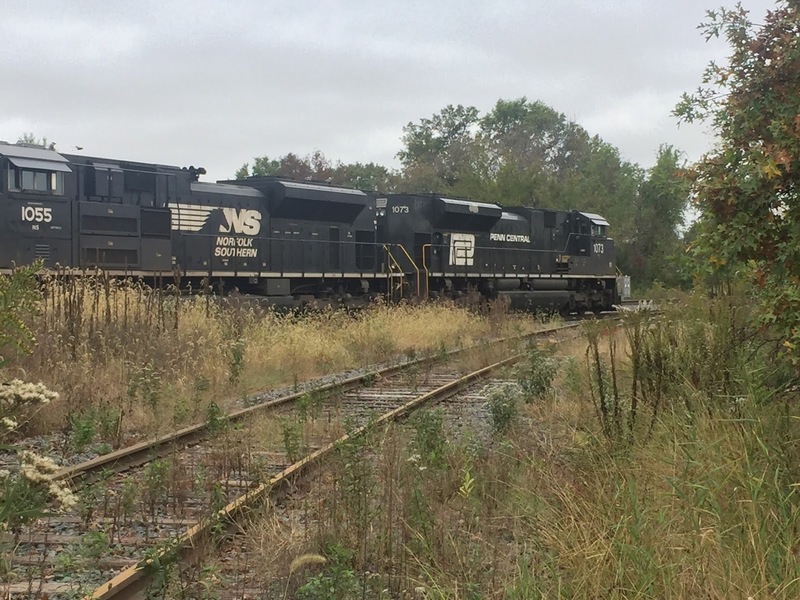 Norfolk Southern continues to monitor the storm closely and is taking precautions to protect employees, track, and shipments. Norfolk Southern is working with customers to identify switching needs and service curtailment. Customers with questions regarding local service should contact their Operations and Service Support, Unit Train, Automotive, or Intermodal representative. Ongoing updates will be provided as this storm system progresses. The latest ETA and routing information is always available through Pacesetter and accessNS. NORFOLK, Va., Oct. 3, 2017 – Norfolk Southern Corporation (NYSE: NSC) today announced that its board of directors has appointed Fredric M. Ehlers as chief information officer, effective immediately.